children use their senses to explore healthy eating, growing food and farming, which develops a foundation for life-long healthy food choices and a sense of comfort and confidence in the garden. In the fall, children harvest from the garden, taste new foods, cook together and visit local farms. During the winter, they learn about the traditional process of turning wool into felt, yarn, and woven fabric. 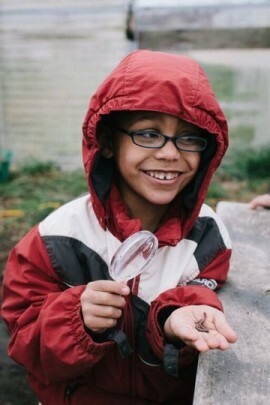 When the weather warms, children discover the magic of seeds and explore their growing garden. Know that everyone can grow food. Feel confident in making healthy eating choices. What are our favorite fruits and vegetables? Which foods help our bodies be strong? What do seeds grow into? What is in our garden? What do we get from farms? Which bugs live in our garden? How do we grow a garden?